Walk with Me | Walking together in Grace in search of Growth. Walking together in Grace in search of Growth. I was driving home tonight and was stopped at a light on Madison and Minor. This intersection is a hub of activity. Two hospitals, multiple apartment buildings, senior living facilities and social services offices all meet at this intersection. It was past dusk, temperatures were dropping and people were rushing to get home, get to an appointment, a bar, somewhere. And I see flashing lights. A Seattle police SUV has stopped at the edge of the intersection. I crane my neck to peak past the car in front of me and see two officers stopping traffic. No accident, no incident. An elderly gentleman, slowly pushing a worn walker, was crossing the street. His bent body and the slow turning wheels of his walker couldn’t move fast enough for the walk signal that was flashing “Don’t Walk” at him before he was fully off the curb. These two officers brought anxious, ready-to-get-to-the-next-place Seattle traffic to a halt. But no one was honking. One officer held the hand of the older gentleman as he feebly stepped up onto the curb. Then they rushed back to their car, flipped off their lights, and just like that, everything was moving again. I glanced down the sidewalk, lit by the neon signs of the Pho shop and pharmacies lined down the street. Slowly, carefully, the old man kept pace to his own time, moving on to his destination. In my rear view mirror the SUV with the flashing lights was long gone. Two minutes. One missed rotation of a light. And I had the opportunity to witness what true covenant looks like. When you pledge to protect and serve, police, clergy, social worker or other, you are making a covenant with your community, with the people you pass on the street, to those whose stories you may never know, that you will stop when it is inconvient, and help. You are pledging to do the little things, without recognition or thanks. You are committing to restoring humanity, dignity, and a sense of community. These officers didn’t hesitated to jump out of their car and make sure this man was able to safely get to his destination. Sure, we don’t always get it right. Absolutely, there are those in uniform, clerical collar, social worker badge and more who mess up, who do it wrong and with ill intent. But I am grateful for the reminder tonight that there are those who hold covenant with community sacred. I have no picture, no names. Just a recounting of what covenant with community looks like when it is done well. 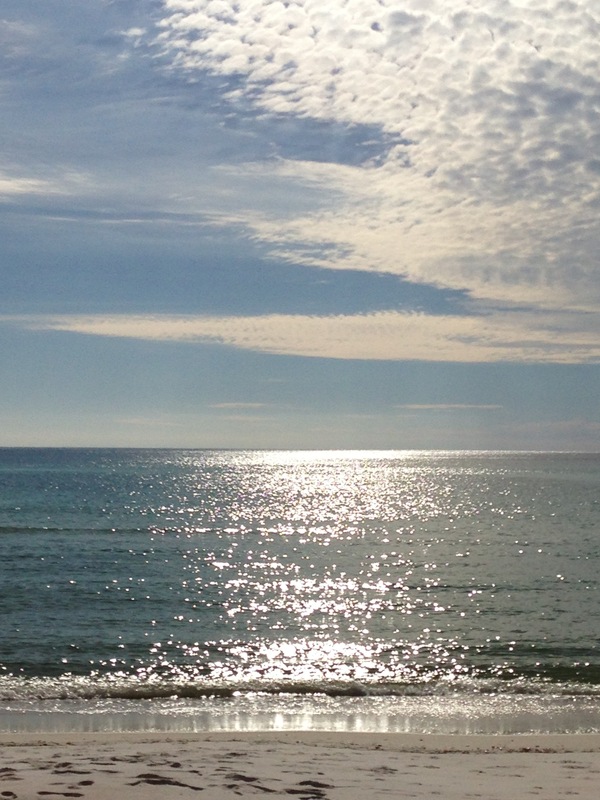 Nothing will soothe the soul like a little Floridian light reflecting off the water. Joy is spending Christmas Eve sharing traditions with my husband. Every year my family travels an hour up the road to spend the evening with my mom’s family. We always meet at the foot of the stairs outside the church my mom grew up in, greeting aunts and uncles and cousins. We file in to the church together, taking in the air of silence as we take up the longest pew in the sanctuary, each year seeming a little more crowded as we grow (in number and in girth). After taking communion together, we head back to Bo and Jody’s house (this year, to MayMay and PaPa’s house, which now belongs to Bo and Jody), where they have inevitably outdone themselves. 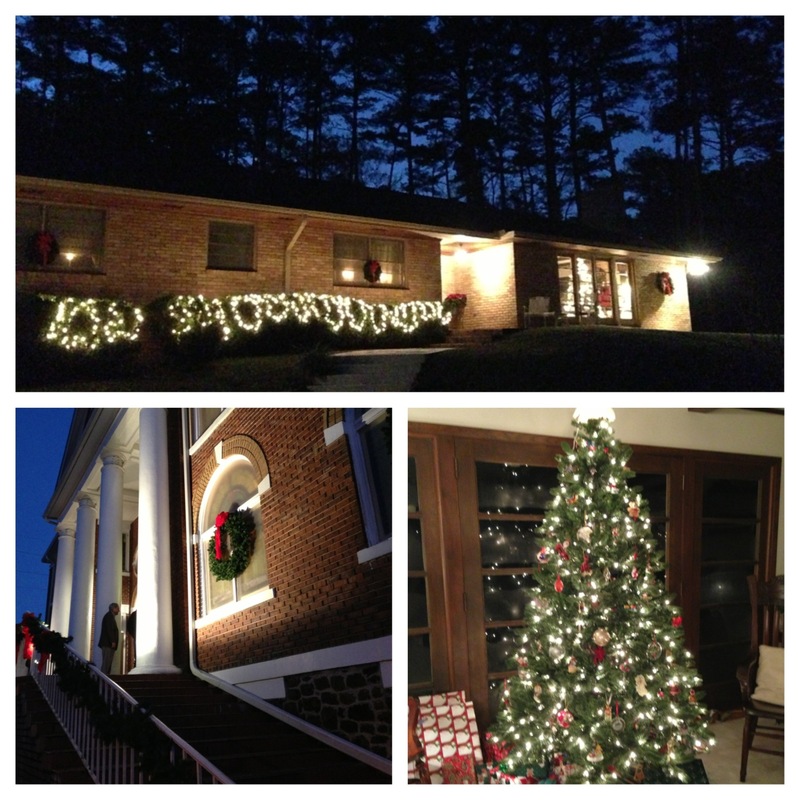 The house is always decorated with charm, and you can count on hearing either Bing Crosby or the Grinch. Then comes the dinner. Smoked turkey and ham, casseroles and salads and oh so much more. Cheese biscuits and cheese balls and for variety, a cheese platter. We drink and eat and laugh and eat. We pass babies around, then we pass the pie. We share stories and jokes and memories. And everything, from the food to the family to the worn pink couches we gather around for a group photo, just feels like joy. Today I showed Kris around my college campus. There’s something really fun about telling stories you haven’t thought of in ages. Tidbits of Huntingdon’s history, using the hill on the Green as a water slide each Spring, and of course, there’s the infamous Oracle Hunt! 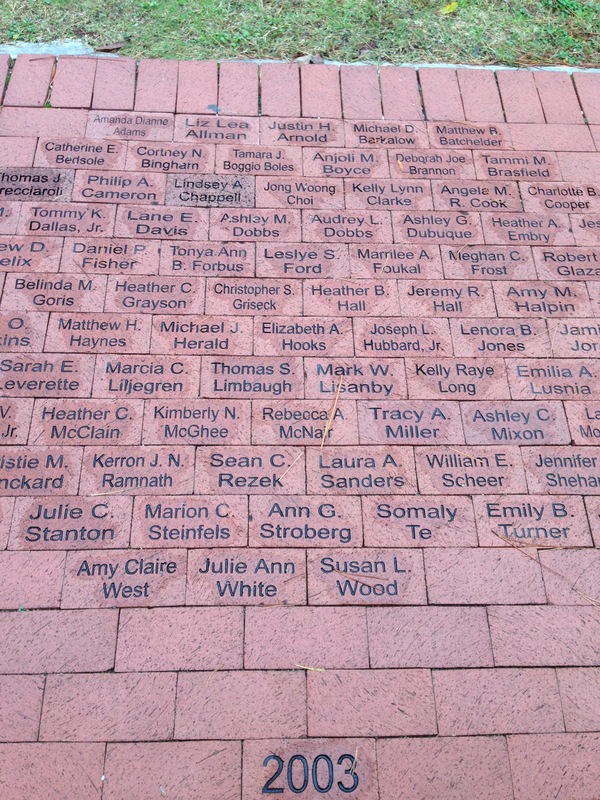 Then we stopped in front of the Student Life Center, where the Graduate Bricks lay. And my name lands somewhere in the middle of classmates, roommates, neighbors and friends. I’m grateful for neighbors who helped educate me, shape me and made me laugh. This week has been full of division, rejection and pain in the United Methodist Church. 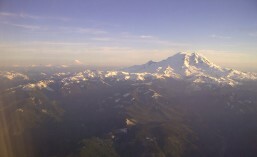 Trials, accusations, and a defrocking have left me looking for signs of the church I love. And this morning, I found my sign. This morning I was honored to witness the baptizing of two fine ladies, one of whom happened to be a child. 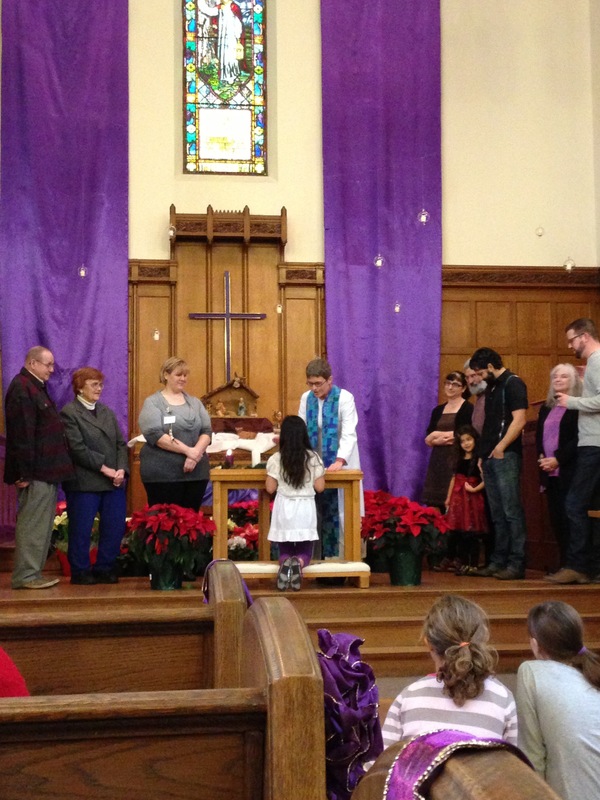 As sweet Luna expressed why she wanted to be baptized, tears welled in my eyes. “Because I don’t know what it’s going to look like, but I know I want to be a part of this community.” As our congregation affirmed that we would support Luna’s growth in our community with our love and prayers, I knew that this is what the church needed: The faith of a young woman who only knows that she loves God, loves her family and loves her church. Luna shared that she sees love when “the community supports places like Mary’s Place and other places with our money. We help make people’s wishes come true.” I don’t think I could have said it better. And so, in the midst of struggle, heartache and uncertainty, I believe in this sign: the welcoming in of a beautiful child into the community of God. 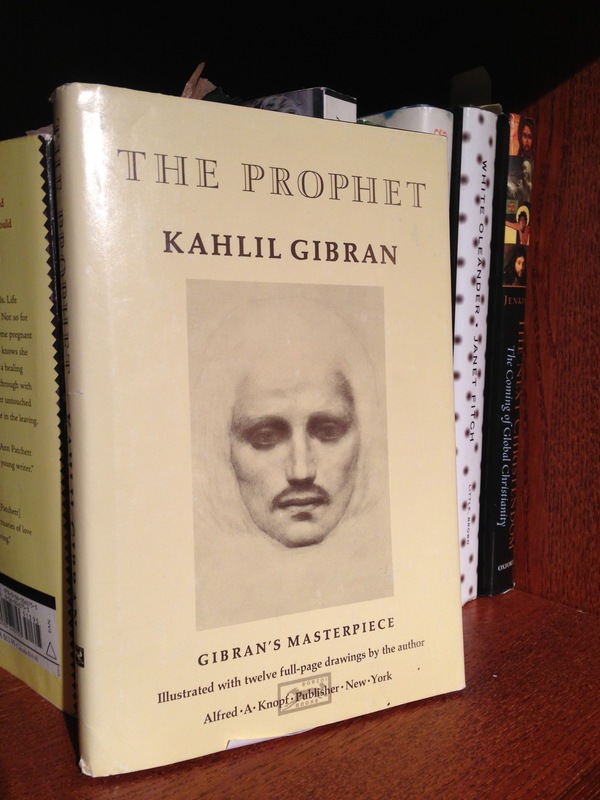 One of the more influential books of my life. A gift from my high school debate coach. How appropriate is it that the Advent word for today is good news? Today is also Drew McLean’s birthday. Drew is a young man that I grew up with, even though he was a few years younger than me. His family was very much a part of my church upbringing. His mother was my Sunday school teacher, he and he brother were in youth group and choir with my sister and I. He was one of those kids you just always knew. But sadly, Drew passed away last summer. Yet his name and his legacy live on. 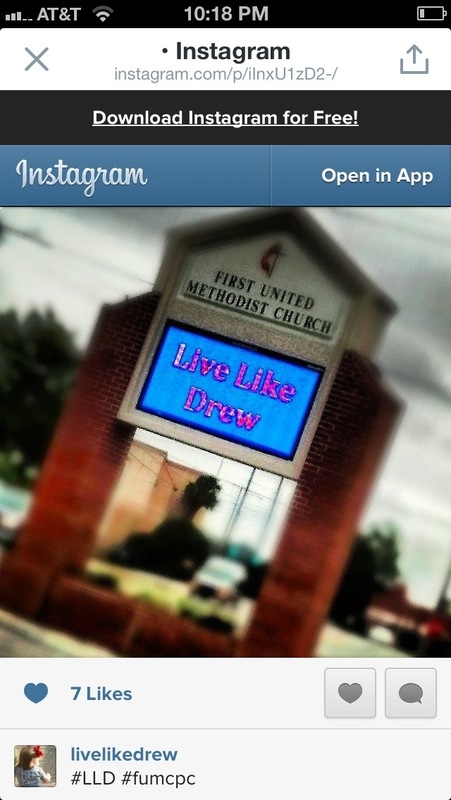 Since his passing, a movement has started called Live Like Drew. It’s a way to call to life the memory of a great guy by living a life full of kindness, warmth and love – all things Drew exemplified. Today, on his birthday, his family, friends and people he never even met have been acting out random acts of kindness in his name. An incredible tribute to a man whose love for God was so deep and so filling, it naturally overflowed to all those he met through small and generous actions and words. One of my clients today shared her random act of kindness. Stepping outside for a quick smoke this morning, she saw an 84 year old man almost get hit by a bus. She and two other women rushed to his side, and realized he was blind. Then helped him across the street. While the other women left, she stayed out in the snow and listened the man shared about how his wife was in the hospital, and he was just here visiting her, which is why he was struggling to find his way around. They chatted for a few more minutes before she came back inside. With tears in her eyes she told me about how she almost passed him by, but was so glad she stopped to help. Her small act of kindness to that man was good news to them both. I then shared with her the idea of Live Like Drew, and told her I thought this was exactly what Drew would have done. May our good news today be that we seek in every moment and situation a way to Live Like Drew: sharing love and kindness out of an overflow from our hearts.